How much overhead to proxies add to SQL databases? Here's a look at two popular solutions. In this blog post, we’ll discuss ProxySQL versus MaxScale for OLTP RO workloads. 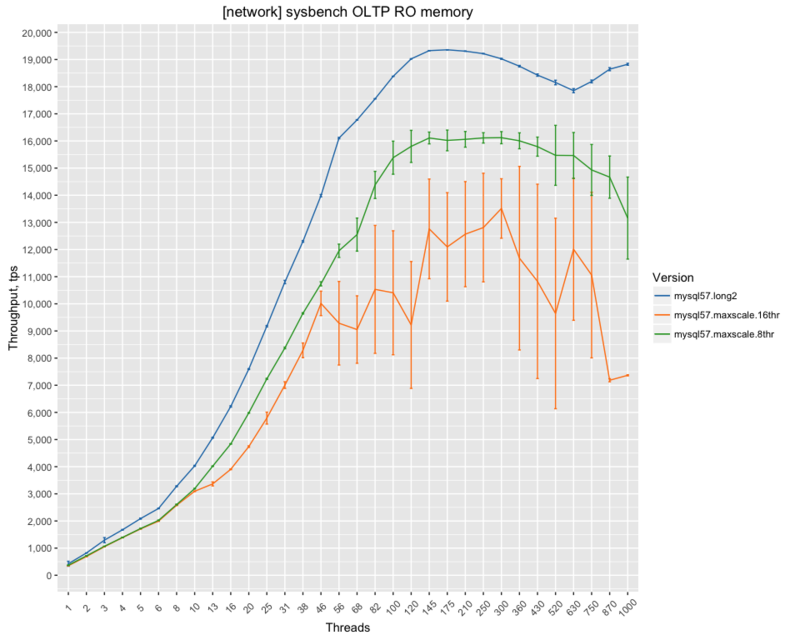 Continuing my series of READ-ONLY benchmarks (you can find the other posts here: https://www.percona.com/blog/2016/04/07/mysql-5-7-sysbench-oltp-read-results-really-faster/and https://www.percona.com/blog/2016/03/28/mysql-5-7-primary-key-lookup-results-is-it-really-faster), in this post I want to see how much overhead a proxy adds. In my opinion, there are only two solid proxy software options for MySQL at the moment: ProxySQL and MaxScale. In the past, there was also MySQL Proxy, but it is pretty much dead for now. Its replacement, MySQl Router, is still in the very early stages and seriously lacks any features that would compete with ProxySQL and MaxScale. This will most likely change in the future. When MySQL Router adds more features, I will reevaluate them then! To test the proxies, I will start with a very simple setup to gauge basic performance characteristics. I will use a sysbench client and proxy running on the same box. 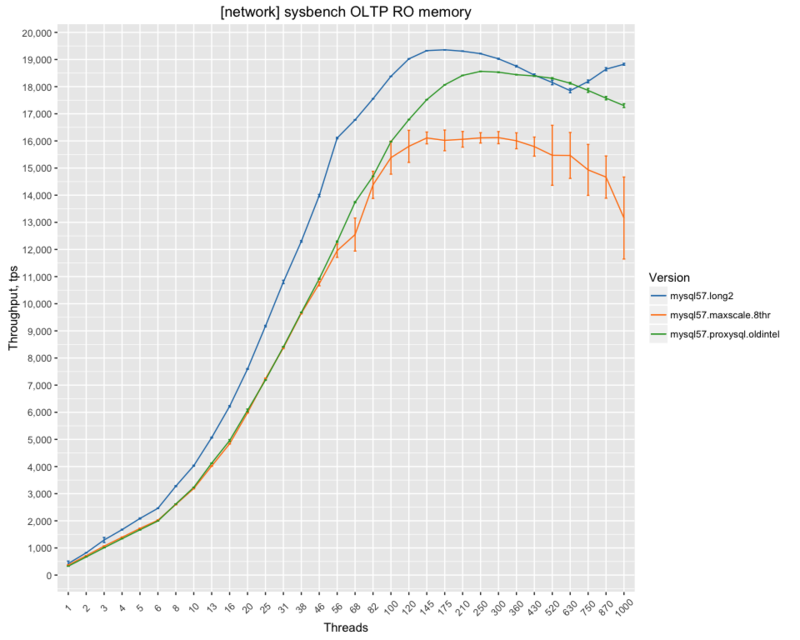 Sysbench connects to the proxy via local socket (for minimal network and TCP overhead), and the proxy is connected to a remote MySQL via a 10Gb network. This way, the proxy and sysbench share the same server resources. 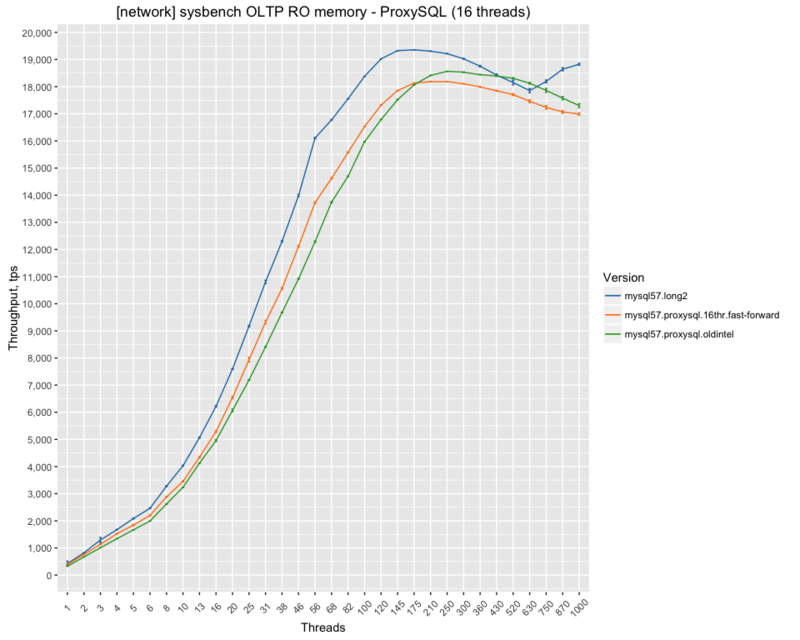 You can find more details about benchmarks, scripts and configs here: https://github.com/Percona-Lab/benchmark-results/tree/201603-mysql55-56-57-RO/remote-OLTP-proxy-may. An important parameter to consider is how much of the CPU resources you allocate for a proxy. Both ProxySQL and MaxScale allow you to configure how many threads they can use to process user requests and to route queries. I’ve found that 16 threads for ProxySQL 8 threads for MaxScale is optimal (I will also show 16 threads for MaxScale in this). Both proxies also allow you to setup simple load-balancing configurations, or to work in read-write splitting mode. In this case, I will use simple load balancing, since there are no read-write splitting requirements in a read-only workload). First result: How does ProxySQL perform compared to vanilla MySQL 5.7? As we can see, there is a noticeable drop in performance with ProxySQL. This is expected, as ProxySQL does extra work to process queries. What is good though is that ProxySQL scales with increasing user connections. Now let’s see what happens with MaxScale. Before showing the next chart, let me not it contains “error bars,” which are presented as vertical bars. Basically, an “error bar” shows a standard deviation: the longer the bar, the more variation was observed during the experiment. We want to see less variance, as it implies more stable performance. MaxScale with 16 threads does not handle the workload well, and there is a lot of variation along with some visible scalability issues. While this chart does show that MaxScale has less overhead from 1-6 threads, it doesn’t scale as user load increases.